It has been far too long since I re-read the classic children’s book, Heidi, and once I picked it up, it was impossible to put it down. Every inch of the Swiss alps, the sound of the goats, the taste of the goats milk, the vision of the sun setting on the mountains, filled my senses so vividly, that I cannot imagine how much more powerful it would have been reading it as a child. I love Heidi. I have no idea which translation I read as a child, and certainly picking a good translation is essential. It’s also important with this classic children’s book to find one that is complete, and not edited in the slightest. Given that, there are probably plenty to choose from. The version that my library offered was a special anniversary edition, with charming illustrations. 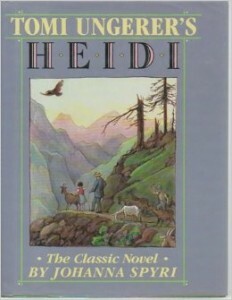 I didn’t remember how much emphasis on faith in God’s ways was integral to Heidi’s character, and yet it was not so overpowering as to discourage anyone who was not of the Christian faith from enjoying the book. Most of all, the celebration of nature, and the powerful healing that nature gives, is a timeless, and I would say, essential message. Please, be sure your children read this classic children’s book. I would venture to say it is perfect for any age…it’s never too late.